Essae-Teraoka Ltd. is an Indo-Japanese joint venture established in 1986 are the manufacturer and exporter of Electronic Weighing Systems includes Weighing Scale, Counter Scale and many more, POS System, Information KIOSK in India with production units located in Bengaluru and Goa. We are manufacturing these products under our own brand Essae. Essae has always stood for excellence in all the business areas it operates. ISO 9001: 2008 certification since 1994 is the mark of its continuous commitment to Quality. The company holds very strong principles and guiding values of creating value for the customer, adhering to the corporate governance and generating win-win situations for all. 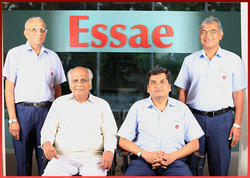 Due to its strong and healthy track record, Essae enjoys high level of trust and confidence of all its stakeholders. The organization is organic. Healthy growth is imperative, not optional. Nobody owns the organization. Trusteeship is the vision by which growth can be established by involving all the stakeholders i.e., shareholders, external and internal customers, vendors, business associates and society at large. Any organization that cannot fulfill the obligations of any of the stakeholders cannot survive. "Win-Win" is the essence of healthy and long-term relationships. We preserve the core values of Quality, Cost, and Delivery and stimulate growth in order to meet the challenges of the changing times. The pragmatic philosophy that one should "Think like a customer" is the key to sustained growth. Preserving the core values is our commitment. Stimulating positive change is our strategy. 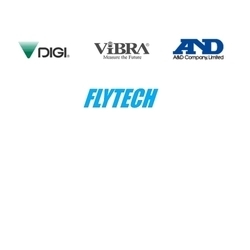 Teraoka/DIGI is a global brand found in more than 100 countries, with an international sales and service team. Headquartered in Japan, Teraoka/DIGI is the global leader in offering Value-added solutions in Weighing, Labeling, Wrapper & POS Systems to its customers around the world with the support of an able sales and service team to earn customer trust. Since 1986, Teraoka/DIGI operates in India through its Joint Venture company, Essae-Teraoka Ltd., with which it has both a technical and financial collaboration involving product development, manufacturing, marketing, export, and service. Apart from this, Teraoka/DIGI group also buys weighing scales for the world market from its Joint Venture company in India. Share the wisdom and wealth for the welfare of external and internal customers, business associates and society at large. 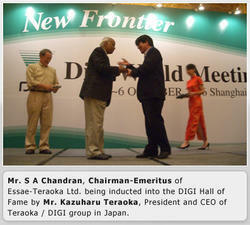 Mr. S A Chandran, Chairman-Emeritus of Essae-Teraoka Ltd. being inducted into the DIGI Hall of Fame by Mr. Kazuharu Teraoka, President and CEO of Teraoka/DIGI group in Japan. Innovation, Improvement and Institutionalization shall be the pillars of our business. We will provide world-class products and solutions to meet the needs of local and global markets. At Essae we consider our human resource practices not just as a processor system driven mechanism but as a way of channeling the collective intellect of the organization. We strongly believe it as the source which energizes our entire business. Essae understands the importance of continuous improvements through consistent learning. This is reflected in our effort to embed a climate for development by conducting well sequenced training programs for its people across all levels. The Essae Chandran Institute, a partner organization focuses exclusively on capability enhancement of the Essaeites. Essae-Teraoka conducts various in-house training programs at regular intervals for service staff all over the country. Work-Life Balance: Essae stresses the importance of work-life balance. The 'Quality of Life' programs, an outbound initiate aims to enable Essaeites to achieve this balance. 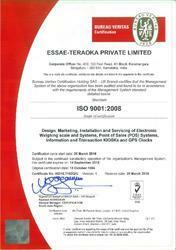 Essae Teraoka Private Limited Is Iso Certified organization. Essae-Teraoka believes in adding high value to all its customers by providing Weighing and POS Systems of superior Quality backed up by a large sales and service network of 46 branches and 300+ resellers. The Joint Venture with Teraoka Seiko of Japan, our exports to the Japanese domestic market and our partnerships with global manufacturers has helped us to offer the best of technology, quality and innovation to our customers in India. Our R&D centre in Bengaluru is able to provide innovative products and customized weighing systems, requirements of which are many times very unique to the Indian market. All our production plants are ISO 9001 certified and cater to the needs of local and global markets. The real secret of our success has been the patronage of our valuable customers, support of all our business partners and most importantly, the contribution and commitment of our Essae team.